This article by director Judith Greene first appeared in the Sage Publication journal Crime and Delinquency in April of 1999. In it Judith argues that Zero Tolerance produced an increase in Civilian Complaint Review Board filings and lawsuits alleging police misconduct but not the decreases in crime its proponents claimed. 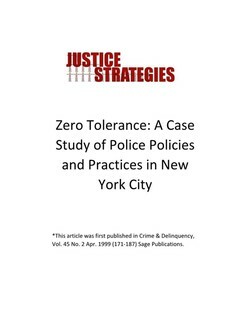 To assert this point the author presents a case study comparing New York City's Zero Tolerance policy with San Diego's problem oriented community policing that produced effective crime control with fewer negative impacts on urban neighborhoods.